While I'm all about pumpkin desserts, there is something so amazing about savory pumpkin foods. Especially when it comes to bread. 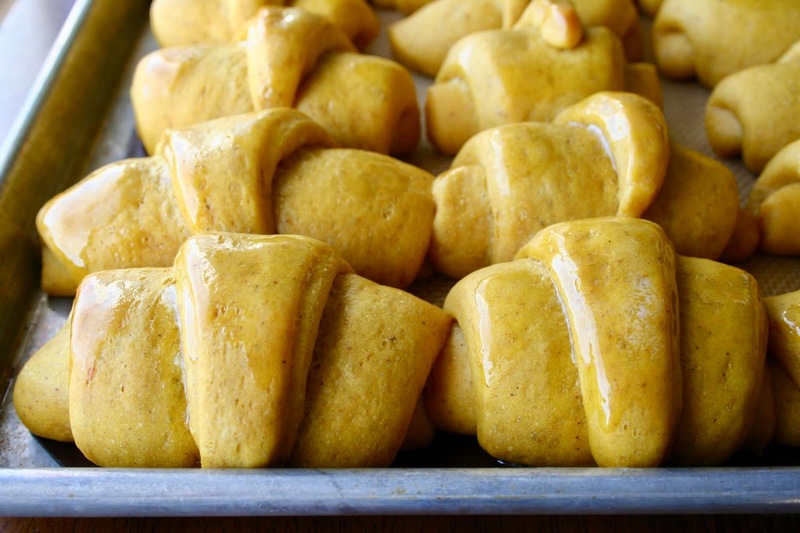 I made these Pumpkin Dinner Rolls a few years back and they've been one of my favorites. 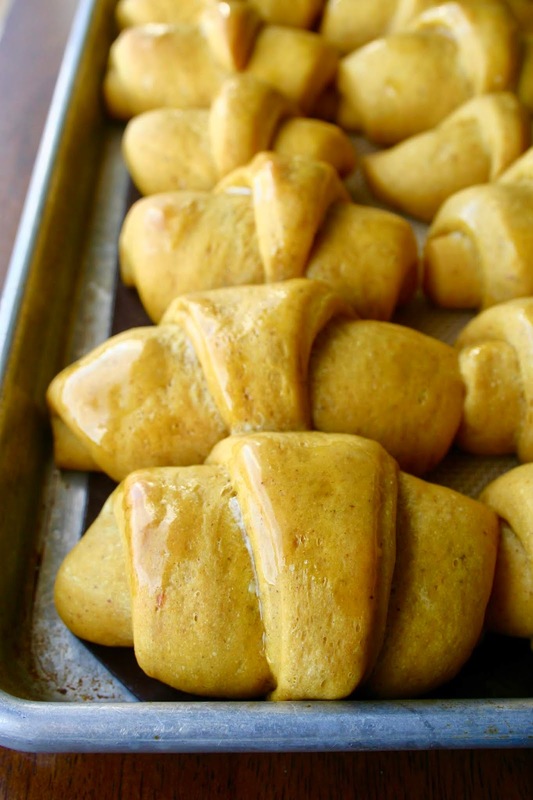 Enter these Pumpkin Crescent Rolls and I found another winner! 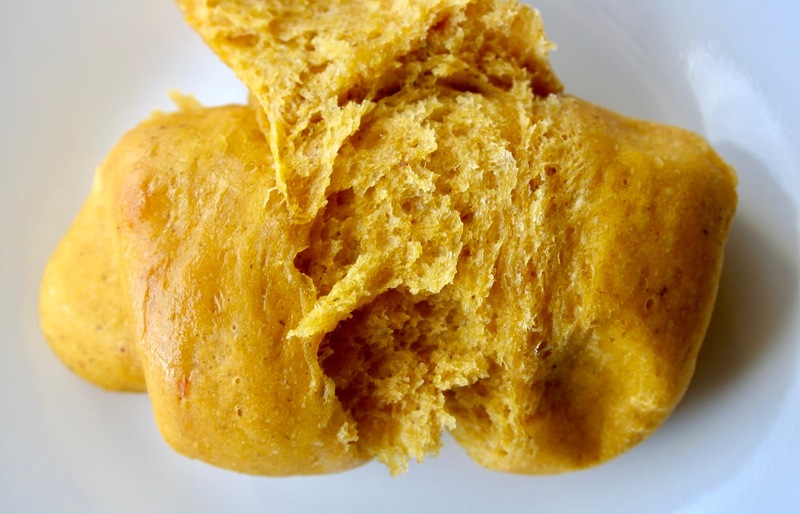 Pumpkin rolls are so dense and have the perfect amount of pumpkin flavor. They also come out so pretty, too! They would be perfect for any meal, but especially for Thanksgiving. I mean just look at the inside of that roll! Don't you wish you had one right now?? 1. In the bowl of an electric stand mixer, whisk together yeast, 1/2 tsp of the brown sugar and 1/4 cup of the warm water until yeast has dissolved. Let rest 10 minutes until foamy. 2. Set mixer with whisk attachment and mix in remaining warm water (1/4 cup + 1 Tbsp. Rewarm to 110 degrees), remaining brown sugar, salt, cinnamon, ginger, nutmeg, cloves, egg, egg yolk and pumpkin puree. 3. Add in 1/4 cup of the butter along with 2 cups of the flour and mix until well blended. Set mixer with hook attachment and slowly add in remaining flour. Knead on low speed until fairly smooth and somewhat elastic, about 5 minutes, adding 1 Tbsp. flour at a time as needed. At the end the dough should be somewhat sticky (it should stick to the bottom of the bowl, but not the sides). 4. Transfer to a large oiled mixing bowl, cover with plastic wrap and allow to rise in a warm place until double in volume, about 1 1/2 hours. 5. Punch dough down and divide into 2 equal portions Roll each portion out onto a lightly floured surface to about a 13-inch round then rub 2 Tbsp. butter evenly over each round. Cut into 12 even wedges using a pizza cutter, then starting on the outside edge, roll each piece inward. Cup the backside of each roll slightly to form a crescent shape then transfer to a baking sheet line with a silicone baking mat. 6. Cover rolls with plastic wrap and allow to rise until doubled in volume, about 1 hour. 7. Preheat oven to 375 degrees F during last 20 minutes of rising. 8. Uncover rolls and bake in preheated oven about 12-14 minutes until golden brown and cooked through. Let cool slightly and if desired rub butter over the top of each roll. Serve warm.